Police Chief Eric Jones of Stockton spoke at a SIEPR panel about the lack of trust between marginalized communities and police (XIN LI/The Stanford Daily). 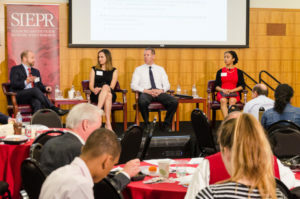 Eric Jones, chief of police for the city of Stockton, participated in a Stanford Institute for Economic Policy Research (SIEPR) panel last Friday to discuss local communities’ falling trust in police enforcement. Stockton is one of six pilot cities receiving a three-year grant from the U.S. Department of Justice as part of the National Initiative for Building Community Trust and Justice, which aims to increase trust between communities and police forces. Chief Jones has been overseeing this initiative and spoke with The Daily about the changes within the city due to his department’s renewed efforts to improve its local relationships. The Stanford Daily (TSD): What inspired you to get involved in the police force? Eric Jones (EJ): I’ve been working with the Stockton Police Department for 25 years now. I did not realize I wanted to be a police officer in college — I went to college and majored in computer science. However, when I was at college, my sociology classes really motivated me to go into the field. I realized that the best way to bring about change was to get actively involved in an issue. TSD: What were some of the challenges you faced while implementing this program? Do you think it has been effective so far? EJ: Yes, it has been effective so far, although we’ve faced many challenges while adopting this program. Initially people did not know what it was about. There were some myths around what the national initiative was — some thought it was the first step to a national military police force. Others were saying, “This is a consent decree and the U.S. Department of Justice is coming in and forcing the police department to do certain things.” The initiative focused on finding the best practices, data and research on crime and policing and finding ways to increase trust, especially in our communities of color where our trust is the lowest and crime is the highest. Educating people inside and outside the department regarding these aims was the first hurdle we had to overcome. It was hard work to first engage with communities and also retrain the police department to adopt ideas of the initiative. TSD: What steps were specifically taken by your department to increase trust levels? Step two was bringing implicit bias training to the police department. Again, we all have biases. What is great is that the leader in that field is [Associate Professor of Psychology] Jennifer Eberhardt from Stanford — she helped us design a curriculum. It’s one thing to talk about implicit biases, but it’s another to teach it to officers on how they can recognize it and not take actions based on it. It was challenging to show police officers that they possessed these biases without calling them racists and pointing out disparities in the criminal justice system that also exist in education, medicine and other fields. Step three is the reconciliation process. This is very unique to the initiative. It is evident that the highest levels of mistrust are in non-white communities like Latinx, African-American and Asian [communities]. This step involves going to these communities and acknowledging that there have been past harms by law enforcement over the years. A key reason for these high levels of mistrust is that historically, the police forces have been used to enforce laws that were targeted towards suppressing these communities. We believe that until we acknowledge these past actions, we can’t build dialogue in these communities. After admitting to these harms, we let members of these communities shape policy and agendas within the police department. These steps have also caused us to reassess some of our parameters of success. Initially, a police force’s success was determined by the number of arrests made. We have realized that this approach does not improve trust levels, so we have instead held frequent meetings with residents. They have provided their perspectives on our performance and have highlighted what needs to be improved. These meetings have been crucial to solving this issue of mistrust. TSD: You mentioned that policies have changed in the police department. Could you mention any specific policy changes you have implemented since the initiative began? EJ: We’re continuing the dialogue. We’ve shifted from a zero-tolerance policy in neighborhoods with high crime rates to a “strategic-focus” policing strategy. That’s been a shift in how we police certain areas. For example, there’s a broken windows theory that most of us think is flawed, where one goes into a high-crime neighborhood and enforces all the minor laws to reduce crimes. We’ve found that this policy does reduce crime in the short term, but in the long term creates extremely high levels of hostility towards the police forces. We’re looking at ways to reduce incarceration. We’re looking at what we can do to prevent the over-criminalization of substance abuse and mental illnesses and instead [how we can] help these victims. TSD: What do you think the role of students should be in improving the criminal justice system? EJ: Become educated to prevent the spread of myths and misinformation. Students should try to get involved in the criminal justice system. What better way to bring about change other than getting involved in it? Most importantly, however, students [should] bring solutions for concerns and complaints.